Wow some really fantastic entries for this challenge. Such creativity! We all had such a hard time narrowing this down! 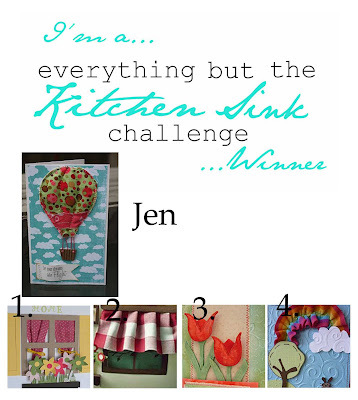 Jen will win the prize from The Cutting Cafe and she'll also have the opportunity to join us as a guest designer! Jen email me at CourtneyMBaker@gmail.com! And go check out these other amazing cards as well. We'll be back Monday with the next sketch challenge! Congratulations to Jen, Vladuska, Heather, and Jo!!! Your cards are AWESOME!!! And thanks for the shout-out, EBTKS DT!!! I am so honored and totally grinning from ear to ear!!! Congratulations to Jen, Lisa, Vladuska and Jo - loved your wonderful cards! Thanks for the fun fabric challenge and for mentioning my card too. I’m so delighted and honoured as there were so many amazing entries! That is awesome. I'm really happy that I can be between those girls. Congratulations to all other four girls and specially to Jen, really great card. oooh thank you thank you! Just got back from holidays and what a lovely surprise!